Even hell, it seems, has a guardian, whose purpose is to keep unwanted souls from entering the fiery abyss. This Hells Doorman Demon Skull Ring offers mortals a glimpse of this enigmatic figure without having to meet it in person. 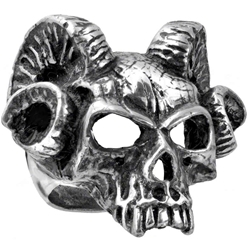 In the case of this ring, Hells Gatekeeper is a traditional demon of the highest order, possessing skeletal, gaunt features, as well as a pair of curled ram horns that really give it a sinister and demonic look. And those features are represented nicely here on this ring, which features hollow skeletal eye sockets, curled ram horns, and of course, demonic fangs that peek just beneath the jaw. The ring itself is made entirely from fine English pewter, which gives it a luster that it will hold for quite some time. The ring is available in several different sizes. It might not be a far stretch to consider this Hells Doorman Demon Skull Ring a signet, one that identifies one of Hells very own doorman, for those who know what to look for, although you do not have to be one of the infernal abyss gatekeepers to enjoy a ring this stylish, either, as goth guys and girls of all styles can don this ring to show off their own impressive style.